Are you a night owl? Do you stay up late and binge-watch your favorite TV series? According to a recent report by Chutian Metropolis Daily, a woman surnamed Zhang, who has myopia (nearsightedness), suddenly suffered from retinal detachment after days of late night binge television watching. 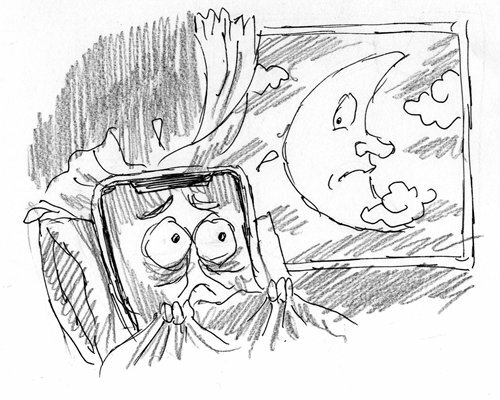 Young Chinese people are not fond of sleeping long hours. Data from iResearch Consulting Group shows that in 2018, 48.7 percent of Chinese people aged 15 to 35 would go to bed after 11pm, and 78.8 percent of these night owls would be fiddling with their mobile phones, watching videos or chatting. However, 80 percent of them believe that good health is important. It seems they just cannot get over the temptation to keep up late. It is understandable that people want to enjoy their leisure after a hard day's work. But they should strike a balance between rest and entertainment, because lack of sleep can cause anxiety, low mood, anger, obesity and many other health problems. If you believe health is important, switch off your phone, tuck yourselves in, close your eyes and have sweet dreams.